Finding the perfect spot for your camera is important in order for you to have a successful scouting. Mounting your camera is as vital as this as well. 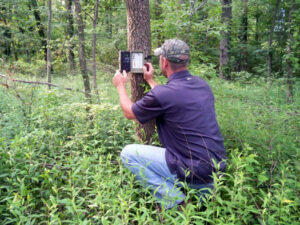 Once you find a good place, the next challenge is how to mount the trail camera into a tree. This is really not that difficult, but there are some guidelines you can apply to make you mounting easier and more secure. Aside from this, you also have to remember to be very quick in installing the camera so that your scent will not stay in the area which the animals may smell. It may also be good if you spray yourself with a scent eliminator. Avoid facing your camera to the east or west as this will put them straight in the direction of the setting or the rising sun. This is obviously not a good idea as there will be a time of the day where you will get overexposed or underexposed photos because of the light. Facing the camera North is best because you will not have a problem with the backlighting. It is best that you bring a compass with you to determine the right direction. While many of you may want to hide the camera under a bush or something else, make sure that the lens is clear of any obstruction. It is best that you initially test the location so you are sure that the view is not blocked by anything. With this, you save yourself from having useless photos in the end. As much as possible, hang your camera to about three feet above the ground. This height will give you best results. Hanging higher and angling the camera downward may also a bit more difficult rather than hanging it at three feet. Also, you have to do it only if it is possible as this may cause a problem in terms of security. This may sound simple which is why it is often overlooked by many. Hanging at a 45 degree angle to the trail will increase the trigger time of your device and give you a better quality of the entire animal. This might sound like a lot to take in, but the more scouting experience you get with the use of your trail camera, the easier these steps will become. It will soon be second nature, and you won’t even be consciously thinking of these things anymore. If you don’t have a game camera yet, go check out the best value for money trail camera.